The Weathercube – Gestural Weather iPhone, iPod Touch, and iPad app makes checking the weather a fun, creative, and engaging experience. You can find current, hourly, and projected forecasts in a bright, modern, and gesture-controlled interface. The Weathercube iPhone app opens with a quick location services authorization, then it leads to a cobalt blue screen with a matrix. This matrix is not your average grid, but it is a clean, graphically intriguing, and well executed interface. At the top of the screen, you will find the name of your location in a menu bar and the date just below it. There are six other items including general conditions, temperature, wind with direction, precipitation, cloud coverage, and humidity. Next, a pop-up tutorial introduces you to the gestures, and this is where the awesome begins. With your thumb and index finger, you swipe both fingers vertically at the same time to reveal the settings options. If you swipe the thumb and index finger horizontally at the same time, you can share the weather with Facebook and Twitter. If you swipe with one finger to the right, you move to the next day. You can double tap a block to reveal the morning, afternoon, and evening projection for all six measured items. 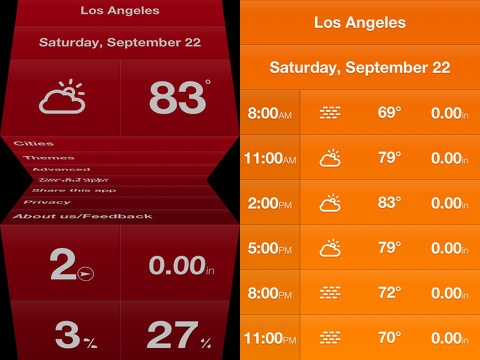 You swipe up from the lower left hand corner for hourly forecast. You swipe down from the top left corner for a six day forecast. The tutorial is available in the settings view, if you need to refresh your memory. Also, if you swipe or tap in a way that does not impact the interface, a handy pop-up will ask you if you’re lost and need help. Yes, there are a lot of gestures, but they are intuitive and sensible. Other handy features available in the settings menu include the ability to change the cobalt blue to other vibrant colors like orange, red, green, purple, black, white, and random. You can also add cities in the settings menu, so you can swipe the city to find out the weather in a location different from your physical location. 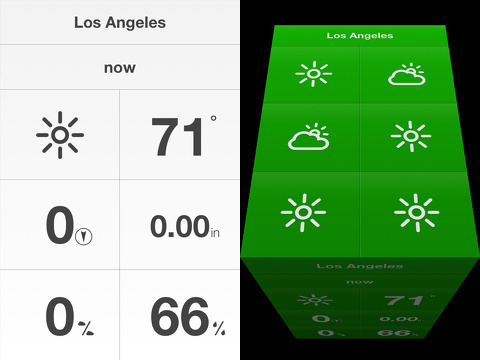 The Weathercube – Gestural Weather iPhone, iPod Touch, and iPad app is a universal download from the iTunes App Store. It is refreshing, unexpected, and exciting, since it thoughtfully incorporates the fantastic functions and tools available for iOS apps. Developer: V2 Digital Media B.V.
AppSafari review of Weathercube – Gestural Weather was written by Jenni Ward on March 7th, 2013 and categorized under App Store, iPad apps, Universal, Utilities, Weather. Page viewed 4564 times, 3 so far today. Need help on using these apps? Please read the Help Page.